We continue reading the aya that we introduced earlier. The 8th Amakami Amateru learned the meaning of the Motoake from his grandfather Toyoke-kami who designed the Motoake chart to teach cosmology. In the verse, Amateru and his sister Hiruko appear. They speak of their parents, the Hutakami Isanagi and Isanami, who taught the Awauta song and thus performed kuni-umi. The word umi means to give birth to. The word kuni can mean land or nation. In post-Wosite days, kuni-umi became the myth of how the islands of Nihon were created by the Hutakami. This aya shows that Hiruko is confused because she is thinking of kuni-umi as giving birth to land. Amateru explains what kuni-umi really means — giving birth to a nation — and how it was done. This fragment contains a profound teaching called Nekoye. Nekoye is the process of transforming ordinary sound ne into speech koye. It lies at the basis of the Wosite language and is closely connected to the cosmology of Motoake. We will give an explanation of the verse. Line numbers are given in parentheses; ff indicates following lines. Nekoye. Hiruko listens to Amateru’s talk about Nekoye. She wants to know more about the beginning of Nekoye (Nekoye no u-i no). Here is Amateru’s explanation (63ff). Amateru teaches the A no Osite as follows. Ame and Tuti separate to make human form (68). At first, humans only made sounds (ne). When they stopped up their breath by closing the mouth, air blows out the nose (71). According to the A no Osite, this air-breath divides into three: clear u, light tirin, middle nu (74). This relates to the three-part creation of things: in Cosmos, of human life, and sound/speech. Then the discussion turns to the process of hatsuon (pronunciation). Note that the shape of the mouth, as it pronounces the vowels, is similar to the shape of the glyphs. The sound of A is made. Moon-making Earth is wrapped tightly (musuhu) by strings (fusa) (76). The tamanowo cord births the Wa of u-A (77). The character of A separates into A-wa with A on outside and Wa on inside (78). The teaching also says that A breaks up into i, then e (80). “Breaks up” refers to the shapes of the glyphs of the five vowels, i.e., the shapes break up or change, in this order: A I Wa. It also refers to the shape of the mouth when saying those sounds. Then Wa becomes o sound. 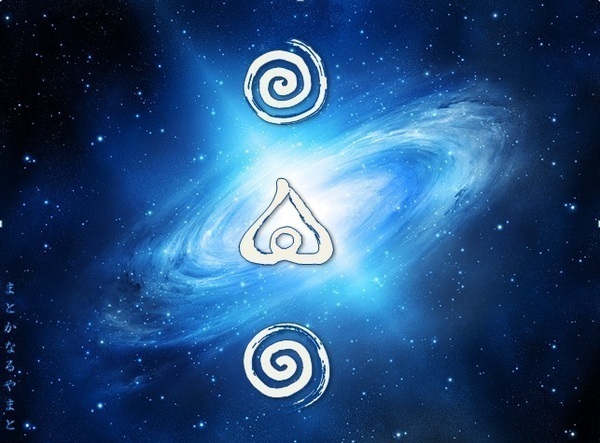 The 5 sounds, the 5 energies are: A is utuho, i is kase, u is ho, e is mitu, and o is hani (83). From the human in-breath, the 5 sounds differentiate into the 48 sounds (85). Thus the Law of Nekoye is revealed (Nekoye no miti akite) (86). Then we can say that Awa (Awa-kuni, the Biwako area) is the placenta (yena) of the kuni (Yamato), giving birth to the eight islands of Yamato (Yamato Yasima) (88). Birthing kuni (89-106). Hiruko says to her brother: In the past, our parents the Hutakami gave birth to three sons and a daughter. How could they give birth to a kuni? (92). Amateru answers: From the start, the people were tasked to spread the Awauta. All went well in organizing the kuni and transforming kuni land into kuni nation. Having kotoba language and being able to communicate with each other, people are able to cooperate and coordinate their activities such as for making rice fields. Auwa is the yena of koye (96), the aya states. Awauta makes the eight shapes of human body (katati) (98). The explanation of how to make ne into koye was taught by Amateru to Hiruko. Hiruko understood and, as Wakahime, continued the work of the Hutakami as she spread the Awanouta and the teaching of Nekoye. Discussion. The Motoake creation chart was designed by the sage Toyoke-kami, father of Isanami and grandfather of Amateru and Hiruko. Toyoke-kami taught the meaning of Motoake to Amateru. The Amoto center of the Motoake creation chart contains the Auwa (A-U-Wa). The first ring of 8 Akuta-kami protects Amoto and the throat. The second ring of 8 Anami-kami produce and protect sound. The two outer rings of 32 Misohu-kami create and protect the human body. All kami together make and protect everything, and everything protects the kami. The teaching is that sound ne is produced, and by the action of the 48 kami, sound becomes human speech koye and language kotoha. We may imagine the concept as follows. Ne is like invisible koye. Ne becomes koye when Auwa serves as the yena or tamanowo, the placenta or the spirit cord, and the Misohu-kami make koye in the physical world. In a sense, Auwa is changing into ne, and ne is changing into koye. Therefore, Auwa is changing into koye, and koye is originally Auwa. This profound teaching is describing how human beings in the physical world are created, and how the Original Presence of Auwa breathes spirit into the ne of humans to convert it into koye of language. The Hutakami performed kuni-umi, gave birth to kuni, by teaching the people how to convert ne into koye. The result is that the people could speak a common language with which they could communicate with each other. Then they could join together in their work such as raising crops and constructing houses. The unification of people is the creation of kuni. This, then, is the story of how kuni land became kuni nation through the Awauta of the Hutakami. In the process of kuni-umi, they taught Nekoye. Nekoye is the power of speech for humans to communicate and collaborate. Amateru and Hiruko Wakahime continued the work of teaching Motoake and Nekoye. Amateru in addition applied the Motoake chart to the process of Hutaomani. The photo shows the Koshikiiwa shrine to Wakahime in the Rokko mountains of Kobe. Credit: Okunomichi. This entry was posted in Mikasahumi, Motoake and tagged Nekoye, Wakahime, Wakauta on 2018-04-12 by Okunomichi. The Motoake chart is shown once again here. It represents hidden laws and the history of Universe. This time we emphasize its aspect of Kohosi, the Nine Stars. The Nine Stars refers to Amemiwoya, the Origin, in the center surrounded by a circle of eight Akuta celestial bodies. Creative energy works through sound and establishes people’s bodies. Although Amemiwoya is not concerned with individual people, nevertheless action always takes place for creation of life. And Awanouta is its song of creation. The Motoake chart represents the birth of life (a baby) as well as the birth of a country (kuni). Kuni today usually means country or nation. In olden days it meant area or land as well as country. This has led to some confusion. The kuni-umi of mythology in the Kojiki has it that Isanagi and Isanami created solid land, more specifically the eight islands of Japan, while standing on the “Bridge of Heaven”. Ōyasima is a beautiful old name for the Japanese archipelago. It means the eight great islands, In traditional Japanese culture, the number eight represents all. Thus Ōyasima means all the islands of Japan. Yatami (ya-tami, eight peoples) means all the people of Japan. One of the country’s sacred treasures is the mirror Yata no Kagami. It is commonly believed that it is an eight-sided mirror. However, in our interpretation, its deeper meaning is the mirror for all the people, the mirror that sees all and discerns ka and ga, the good and the bad. To summarize, the Awanouta is a song of creation. As such, it contains all the sounds of the Motoake creation kami. Just as Amemiwoya gives birth to Universe and all that’s in it, the Awanouta gives birth to a country (kuni-umi) and unifies the people. Singing and reciting Awanouta is a way for everyone to connect with the kami of creation. This entry was posted in Awanouta, Motoake and tagged Amemiwoya on 2016-02-27 by Okunomichi. Awanouta (Awa no Uta) is a powerful song. See it in the box above. All figures provided by S. Sakata. It is comprised of all 48 of the creation kami as taught by the great sage, Toyoke-sama. Toyoke-sama designed the Motoake chart to teach the creation of Universe by Amemiwoya, Great Origin, and the 48 kami. The Wosite syllabary itself is powerful since it contains all 48 of the kami. Indeed, one can say that the Wosite language is powerful. Wosite contains the power of sound, the power of human voice. The Awanouta was composed by Isanagi and Isanami, the futakami (two kami, the kami pair) who served as the 7th Amakami in Wosite era. When they first came to live in the capital, there was something they noticed. Although the two of them spoke proper Japanese, the people of the land found it difficult to understand each other because of their strong regional dialects. The two Amakami thought that it is important to clear the speech of the people to proper language. They would base the teaching on Motoake. When people sang the Awanouta, their speech would become beautiful and they would naturally acquire a unified sense of being Japanese. Further, the Awanouta contains the hidden laws and history of Universe. Creative energy works through sound, and sound energy establishes the message of Awanouta in people’s mind and body. The song begins with a and ends with wa. As we know, a represents Cosmos, and wa represents earth. The song contains hidden energy of the creation of Universe. It applies to the birth of a baby as well as of a kuni, country/land/area. The figure above shows the Awanouta in the box. Isanagi sings the first two columns and Isanami sings the next two columns. Note the eight ideograms shown in green. They are: a, i, hu, he, mo, wo, su, si. Did you realize that they are the eight Anami-kami in the Motoake chart? They were discussed in a previous post, Hutomani Part 1. These eight appear in the second ring (pink) of eight kami in the Motoake chart. Observe that there are three colors of ideograms in the poem: Green indicates the phrase, yine nana miti. In blue, kami husoyo koye isanagi. In red: simo husoyo koye isanami. We will explain them shortly. kuni ume (umi) / birth of a country. tami / people. kotoha / language, speech. hutu / very. kumori / dim. naosu / to fix. kankayete / thinking. yi ne / 5 root. nana (ne) / 7 (root). miti / law (in this case). kami / upper or first (in this case). simo / lower or second (in this case). hu-so-yo / 20 plus 4, or 24. utai / sing. turane / to continue. they thought of law of 5 and 7 roots. by Isanami who continued the song. Isanagi and Isanami give birth to the country. This verse is telling the story of the time when the speech of the diverse people was “dim”, that is, not clear, and they had difficulty communicating with each other due to their distinct dialects. Isanagi and Isanami thought of a remedy. Based on the intonation of the language, they felt that they would focus on a backbone of five and seven syllables (yine nana miti, the green ideograms in the poem). Five and seven are the base of syllables and grammar, the unique rhythm and intonation of the Japanese language. They composed a song of 48 syllables, and Isanagi sang the first half (kami husoyo koye isanagi, it says in blue) and Isanami sang the second half (simo husoyo koye isanami, in red). The reason they are called the kami upper and the simo lower will soon become clear in Part 2. To protect the pronunciation, rhythm, and syllables of the five and seven, the eight Anami-Kami were placed at the beginning of each phrase in the Uta. These are shown as the green ideograms in the Awanouta. From the age of Woshite to the present day, for more than three thousand years, the rhythm of five and seven is in the Japanese poetry, language and mind. Haiku and tanka poems employ 5 and 7 syllables. This entry was posted in Awanouta, Motoake and tagged Amakami, Isanaagi, Isanami on 2016-02-27 by Okunomichi. In the previous post on the Ahara waka, we connected the terms: ahara, anohara, takamanohara. The a in ahara and in anohara, as well as the ama in takamanohara have the meaning of Cosmos, where high kami dwell. Takamanohara may be deconstructed to be taka-ama-no-hara, where taka means high and hara means place. The term Takamanohara is better known to readers of Japan’s creation myth. Isanami and Isanagi are the kami couple who create the eight islands of Japan while standing on the “floating bridge of heaven” in Takamanohara. This, of course, implies that Takamanohara is “Heaven”, and is often pronounced Takama-ga-hara. We would like to give another version of the creation story, the version taught by the Wosite documents. To the present-day Japanese, Takamagahara – known in English as “High Plain of Heaven” with “ama” translated as “Heaven” – is a mythical place. This idea is based on Ki-Ki (the documents Kojiki and Nihon Shoki from the 8th century). The true history of Japan was changed by Ki-Ki. This is very unfortunate. In this Ki-Ki view, only “heavenly” kami dwell in Takamagahara which is separate from the world of people. Indeed, when this happened to the name, people were moving away from a deep connection with the kami. Originally, Takamanohara (note the spelling) was a place of kami and people. It was referred to as if it were in Ama, Cosmos. The significance is that people and kami were in harmony with Ama, Cosmos. Takamanohara was a place on earth where people tried to live and make decisions in keeping with the way of the kami, with the way of Nature and Universe. The name changed after the Woshite period and it picked up a voiced consonant (“ga”). A voiced consonant generally abbreviates the original meaning and gives a negative connotation to it. So “Takama-no-hara” in changing to “Takama-ga-hara” became limited in scope and in imagination, and it lost its pure aspect. It is hoped that by exposing the nature of the Woshite world, we can show our readers the worldviews of the Woshite people. This Woshite worldview regarded humans in unity, or at least humans that intended to be in harmony, with the kami of Takamanohara and with all of Nature and Universe. Please re-read Welcome to the World of Woshite regarding kami and Ama, http://wp.me/P6TKUT-3. As you continue to read our articles, you will develop a clearer understanding of the World of Woshite. The World of Woshite was in harmony with the Way of Ama. This entry was posted in Hutomani, Motoake and tagged Ahara, Takamanohara on 2016-02-27 by Okunomichi. Here is an example of one of the 128 waka, the ahara (a-ha-ra) in the Hutomani anthology. In the above chart, it is the triplet of Anami 1 with Misohu pair (2) and it is outlined in red. This beautiful chart by S. Sakata was created especially for this article. a-no-hara /amanohara /cosmic field where cosmic kami gather. hito no hara /miya / the place where human kami leaders gather, the central figure being the Amakami. atumaru / to gather. kami /a human who possesses great ability and has earned high respect; also kami is a powerful cosmic force of nature. situku /a beneficial dew of rain or light, flash of energy. waza /technology, methods, law, ability. miti / way, law. umi / born, produced. receive beneficial drops of rain and a flash of energy. Thus a way is born. The way, of course, is the solution to a perplexing problem faced by the people. The way is also in harmony with the laws of Cosmos. This waka suggests a deep connection between the Takamanohara of the Cosmos and that on the earth.The human kami leaders gather at hito-no-hara on earth with the Amakami leader as do powerful cosmic kami who gather at A-no-hara cosmic place. The abilities of the people are increased with the benefits of rain and light from the sky. This entry was posted in Hutomani, Motoake and tagged Ahara on 2016-02-27 by Okunomichi.